Here are some of our Clients’, Partners’ and Friends’ testimonials, which most honour us. With the new applications implemented by INFOS, we were finally able to reach a high level in the information and management data speed, which provides us efficiency and assurance when processing them. We are truly satisfied, that is why we recommend these applications. Chief Executive da ARCOL - A. Rodrigues Correia Lopes, S.A.
Information for management is more and more a competitive advantage for companies. That is why having Infos as a partner is very important in order for us to reach that goal. Devotion, professionalism and innovation are some of the characteristics of this partner of ours that allows us to keep on improving our management control. We have always seen INFOS as a strategic partner, when it comes to defining our organisational structure, and not only just a services and a computer equipment supplier. During these past 25 years of a relationship that has been more than just professional or commercial, we may say that both companies have influenced each other. Our demands and requests have always been met by INFOS, who many times has surprised us with bold proposals. Looking ahead, we dare to say that there are, certainly, many more common project opportunities because, luckily, INFOS potential on all fronts keeps growing every day. Thank you for Your services and availability. General Director da Mercatlas – Distribuição Lda. INFOS availability and professionalism has been key to the Multi and Maxiretail IT project implementation. INFOS is an indispensable partner for MERCATLAS project success. The partnership SANER/INFOS has enabled the development in the implementation of IT solutions with undeniable benefits for the management of the efficiency in business processes, thus giving SANER a greater responsiveness to the daily needs and to the new challenges that arise. We count on INFOS professionalism and devotion in order to proceed the sustainable long-term growth strategy. Director da Bulhosas [Irmãos], S.A.
From the point of view of management, nowadays it is vital to count on trustworthy information systems to work as a proximity management support between all strands of a company. Infos is a credible partner, that has always been able to understand and fulfil our needs, and that gives us confidence when it comes to long-term expectations. Director da Embalnor – Embalagens Normalizadas Lda. 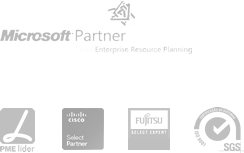 Embalnor made a strategic investment in the ERP Microsoft Dynamics Navision, thinking about the company’s future growth and internationalization. Three years after its implementation, we see that it was a winning bet, which had led to productivity profits visible in the daily job. It eases the internal processes and it is an essential tool for a better team performance. We must highlight the quality of the INFOS team that has implemented this system in Embalnor, with a deep knowledge on the business, and the administration’s strategic guidance. Along these years, the Multi system has proven to be a trustworthy and essential tool for our business development. Infos team has demonstrated to be a partner in the evolution and ongoing improvement of this IT solution interconnected with our business area specificities. The current rhythm and demands of the market in terms of innovation, reliability, competitiveness, rationalisation and flexibility require that the persons in charge have access to effective Information. That is, to the correct, strictly necessary, precisely at the right moment of the decision-making information… and this is possible at FDG thanks to the Multi application. In a competitive and dynamic world, we are also aware that there are no perfect models, that is why we trust in our partner Infos and in its team to understand and face up to our challenges and needs every step of the way, through optimised solutions constantly adapted to the new realities. Infos has become a partner essential for our operation. Thanks to the technological support implemented, it was possible to reach a better information flow control, which has allowed us to focus ourselves exclusively on our business. The ERP Multi/Maxiretail’s liability and safety has simplified the technology that we use. We count on Infos Excellence and professionalism to keep supporting our growth.